Turns out that Sungjoon had already seen Hari’s name on an Employee of the month poster hence his very stilted tone during that phone call. He catches her just as she leaves. Sungjoon drives away, starting to cry as he remembers all the parallels: Hyejin’s hair, “it’s a go!”, her being his umbrella, her laughing when he picked out all the peas. Meanwhile, Hyejin’s stands frozen in Shinhyuk’s embrace. 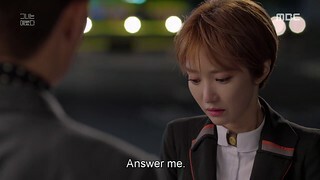 A call from Sungjoon comes in, and he half-amusedly, half-bitterly (that has to be his trademark…and it makes my heart bleed) tells her to take it. Sungjoon starts out using formal language (the endings of which are pretty characteristic) but then uses banmal, weeping all the way. They rush out to meet each other, talking on the phone all the way, and we’ve the dramatic moment when Sungjoon grabs her hand and pulls her close. 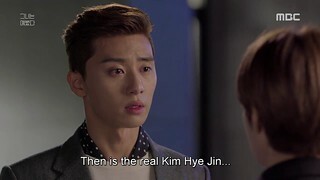 Sungjoon: I’ve found you, Kim Hyejin. I’ve finally found you. Why on earth did you hide? Why didn’t you say anything? Do you know how much I-Nevermind. Nevermind, Hye Jin. I recognized you far too late. I should’ve found you earlier, but I was late. I’m sorry. You must’ve have a hard time by yourself. You were so close to me this whole time. How stupid am I for not having recognized you? They walk together, and the truth comes out. How she’d felt when he’d walked past her without recognizing her that time they were supposed to meet, the huge chasm she’d felt between who she’d been then and who she was now, and just how large that lie grew. And this beautiful, honest conversation takes place. Sungjoon: Wait a minute. Now that I think about it, I’m beginning to feel a bit sad. Sungjoon: If my situation had become worse than before, then would you have been disappointed in me and regretted meeting me? I thought that that sort of thing wouldn’t be important, particularly between us. Was I the only one who thought that way? No matter how your circumstances had changed, no matter what you looked like when you appeared in front of me, it wouldn’t have mattered to me all. Never. Hyejin: At that time… if I hadn’t hid myself like that, it would have been so much… so much better. I’m regretting it. From where and how should I explain? I didn’t think I could tell you everything in person so I’m writing you a letter instead. 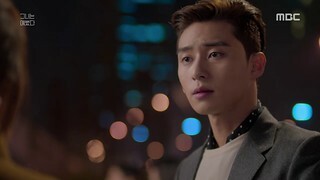 First, I’m sorry Seong Joon. Really… there’s nothing else I can say besides I’m sorry. Strangely, whenever I was having a hard time, I kept bumping into you. Each time, I was comforted by your words and your actions. I even thought for a second that you and I were very much alike. 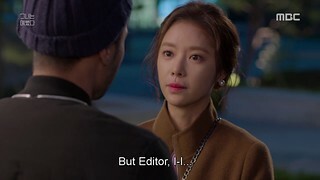 All of it, you only said what you did because you thought I was Hye Jin. Stupidly, I was mistaken.So for a while, I was bad and got greedy. I’ve been thankful… and really, I’m sorry. 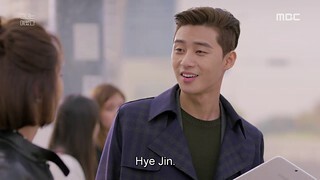 It’ll never be enough to say it but I’m sorry.All that time when you thought I was Hye Jin and even now, the Hye Jin that you like, there’s only one… and I know that well. For uselessly cutting in and making you take the longer route, I’m so sorry. Hye Jin and you, sincerely, really sincerely, I’ll be rooting for you. – Hye Jin’s friend, Ha Ri. Hyejin dashes off looking for Hari and finds her crying. She says nothing and quietly watches her, crying in turn. Hari;s out of all next morning, faking a chipper mood which Hyejin sees right through. 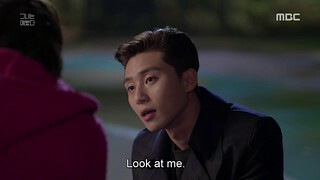 Meanwhile, Sungjoon practices his best “Hello Hyejin” in the mirror (you adorable man). 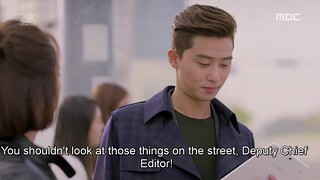 Hyejin meets him at the crosswalk, while he’s engrossed in this tablet as usual. She stares at him for a long time before saying hello. 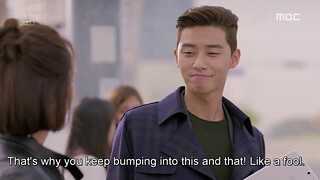 Sungjoon’s delighted to see her but Hyejin continues rebuffs his every attempt to sling an arm around her or be friendly. 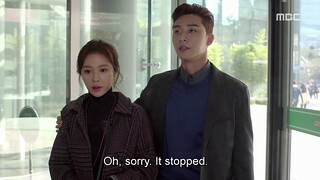 The air between them gets increasingly awkward to the point where Sungjoon resolutely punches in 20 on the elevator and takes her to the roof. Hyejin awkwardly chatters on and on about how they should find their other classmates too, making it clear that she only considers Sungjoon a classmate. He looks more and more upset when she mentions keeping their professional and persona lives separately. He wonders why she’s acting like a different person overnight, when they were definitely on their way to romance the previous night. 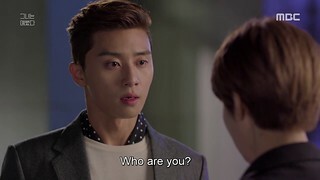 Hyejin thinks to herself that Hari likes him, and doesn’t give him a reason when he asks why she’s acting like this. 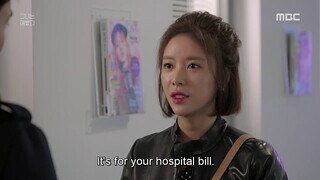 Things get increasing awkward at work when Hyejin tries to pay Shinhyuk’s hospital bill. 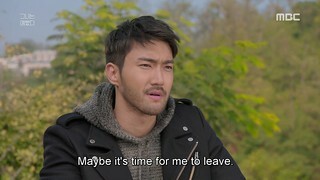 Say hello to passive agressive Shinhyuk. Poongso sees that they aren’t stuck at the hip today and wonders what happened, and “how far they went”. 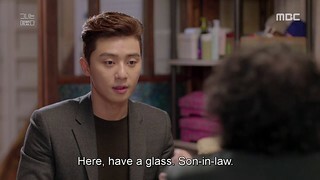 Sungjoon catches the tail end of the conversation and seems to wonder whether he’s been rejected for Shinhyuk. Awkwardness is the theme of the day, as Sungjoon orders Hyejin to just send him the meeting minutes instead of entering his office, but stops being harsh once the words come out, saying that he can’t just be her classmate. Hyejin seems about to say something when Director Cha comes in. She sits at her desk and sighs, which Sungjoon notices. Shinhyuk speaks to someone in English saying that he misses whoever it is took and to stay in touch. Hyejin arrives home to find Hari out with Mr. Sleazeball whose name Hari doesn’t even know. Cue the row we’ve been expecting for but for the reasons we expected it. Hyejin: If you are upset, you’re upset. If it’s hard, it’s hard. Just tell me. Don’t act like you’re fine. Hari: Why are you yelling? Of course I would tell you if I was upset! Hari: The one who is acting like they know or that they are okay… Isn’t that you? You should be asking mev”Are you a friend?” “How could you do something like that to me?” “You’re the worst! You’re disgusting and I never want to see you again!” You should be mad at me! Hari shrugs it off saying that it’s all she can do, and that she’ll “disappear”. Hyejin disagrees, she’s the one living at Hari’s place, so she’ll leave. She packs some of her stuff up and goes to her family, who all ask where Hari is. Hyejin snaps that she doesn’t know. Sungjoon calls Hyejin (how cute is it that he’s saved her ‘My Umbrella’ on his phone?) asking her to meet him only for her sister to pick up. 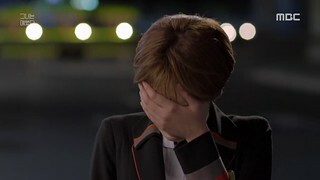 Cue a horrified Hyejin discovering that Sungjoon’s come over. Her parents are wonderful and reminisce of when he slept over at their place while Hyejin looks more and more horrified. Then this happens. I LOVE how Hyejin directly put herself as ‘the girlfriend’ her parents were asking about. And I LOVE that Sungjoon was completely straight-up about the fact that he meant to get her. Hari get a surprise visit from her mother who asks her to come with her. She seems hesitant, but I think we know her answer. Okay seeing your parents creeping over your crush has to be weird. But I love how they’re all “have a nice time together!” I love how Hyejin’s all like “what do you mean?” shoos them away then proceeds to creep on him anyway. 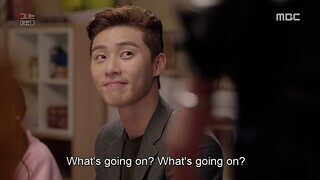 I love how confused Sungjoon is upon waking up. This is such a KMHM moment, honestly. 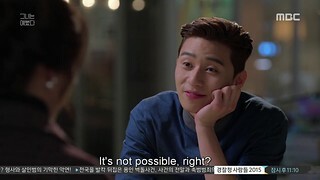 Sungjoon asks her to talk to him. They go outside and Hyejin at first wonder if he’s gotten her confused with the romantic, bright aura that surrounds first-love to which he says that she took the place of his mother, and was his best friend at a time when he really needed one but he loves her for who she is now (thank you so much, show, for truly showing this to us). 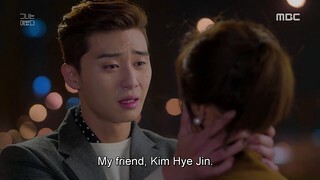 Hyejin confesses that Hari liked him a great deal. Hari’s more than a sister and Hyejin feels the same level of affection for her that she does for Sungjoon, so dating him wouldn’t feel right. (Have I already mentioned that I love this girl?) 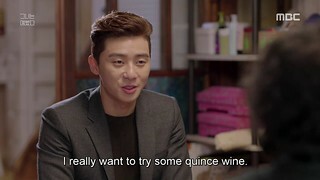 Sungjoon, beautiful man that he is, says this in return. Aww! The next day, he’s all goofy smiles and purposefully bumps into the revolving door for it to stop so he can sneak in beside her. 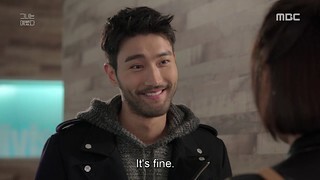 Everything’s fine and dandy until the MOST team discovers that Shinhyuk’s been scouted by New Look (their rival magazine) and plans on leaving. Sungjoon looks more stressed than ever at hearing that, despite them having set a new record for sales (within the magazine’s sales history), seeing as they still haven’t taken the 1st spot for sales that month (which went to New Look). Hyejin tries to get him to destress that night with a cup of coffee (not a good idea, my girl) and Sungjoon asks for her a hug, only to pretend he was joking when he sees her awkward expression. Sungjoon searches up where Shinhyuk lives and goes to, to try and convince him to stay. He honestly tells Shinhyuk that he needs his skill and even tells him of the magazine being shut down if they don’t reach #1 in sales but Shinhyuk, though polite and tiny bit flattered that Sungjoon came this far, refuses. The next day, Shinhyuk doesn’t show up for work. Hyejin calls him repeatedly only to discover that he’s checked out and cleared out his room. She discovers that Hari’s not at work either and races home to find her, only to arrive to an empty house. Hari’s cleared out and disappeared as promised. Hyejin races to the airport and breaks down in tears remembering when Hari pushed her home in a shopping cart after she hurt her knee. She sinks to the floor, sobbing, but it’s too late, Hari’s gone. Well here’s a fine pickle. Is Hyejin going to go full-on noble idiocy on us now? Or is she going to fight for Hari’s friendship while realizing that she is fully entitled to pursue Sungjoon? I’m going to be honest here. This ep crashed and burned at the 21 minute mark for me. It slowly, got better 44 minutes when Sungjoon was being an angel. I like that Hyejin loves Hari so much and doesn’t want to hurt her. 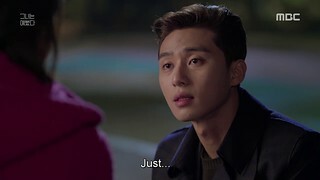 But pushing Sungjoon away like that without telling him the reason (and it was so bloody obvious that something was off, she did a 180 overnight!) was bloody stupid. I’m glad that she told him (during this episode as opposed to stretching it out) but I think she’s selling herself far too short. Sungjoon’s made it clear, he likes her, and her alone. Hyejin’s perfectly at will to pursue whom she chooses, because Hari’s the one at fault here. Hari’s acting like a kid by running away from the problem but she’s sort of doing the right thing here because they both need space from each other. There’s a lot with this episode that’s throwing me off a little. 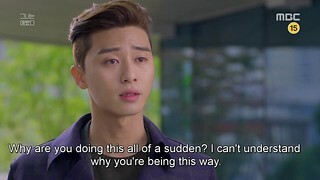 The angst, when it came, in KMHM was utterly perfect. It was a problem with devastating emotional impact that I could see no easy route out of. But this, like with Pinocchio (my standard for useless angst) is solvable through conversation and distance. So if Hyejin decides to give Sungjoon the cold shoulder, I’m seriously going to be pissed because it’s not inline with the honest, open (I mean she confessed her feelings to Shinhyuk so easily last episode) woman we’ve come to know and love. 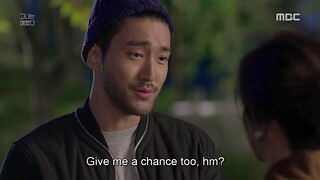 And speaking of ”know and love’, I know I wanted character development for Shinhyuk but having him act like a petulant child wasn’t it. It’s one thing to be awkward and passive agressive around Hyejin, it’s another to not care if your workplace is jeopardized and not even give your two weeks notice. 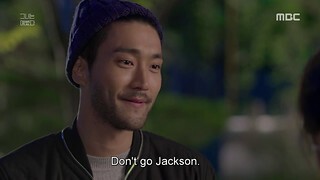 That’s not the Shinhyuk we now and love, and I’m frankly worried about the avenue this scriptwriter is heading now. The solution for our foursome’s problems (as with Pinocchio) is far too simple: FIGHT TOGETHER FOR WHAT YOU BELIEVE IN. Be it love or a magazine or friendship. It’s that simple and I’m hoping that we don’t go down a useless angsty route here. It would be such a shame. 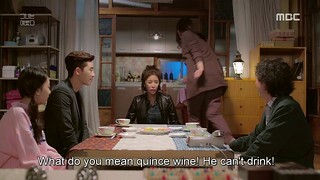 oooh, this is really good as I also watch without english sub & just laugh & cry with the character wondering what is all about… Well done for the recap! Thank you! Thank you! Thank you for the recap!